If you love to learn, study, practice and get into the head of an artist then you are in for the most wonderful creative adventure with Michelle Wooderson. So many of you have been asking for more Studying Under The Masters courses and if you know Michelle (or once you know her) you will know why she was the most perfect artist to lead the next one. Michelle has a deep love of learning and exploring art techniques and she walks this out in her own life with daily practice. Her Instagram feed is a constant source of resources and inspiration for many of us. Michelle’s heart is as a teacher in how she shares, teaches and encourages. It is one of her most beautiful gifts. 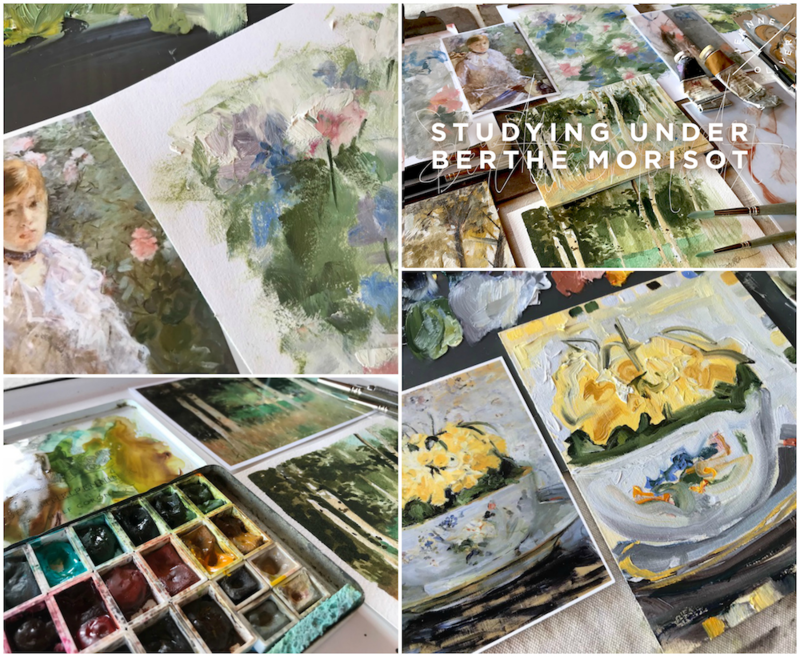 So, don’t be hesitant about studying under a master because Michelle will make Morisot come to life and you will leave feeling lavished in your art. 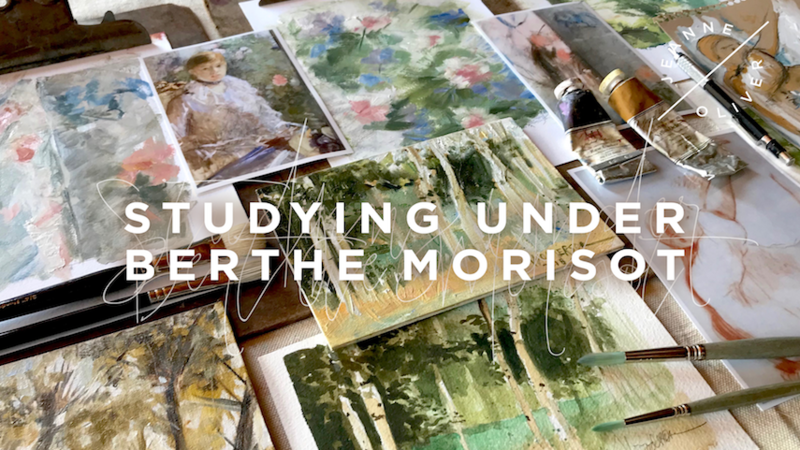 Studying Under Berthe Morisot with Michelle Wooderson begins Tuesday, December 4th with Instant Access. Registration is $62 and the course is 5+ Hours of Content. Come and read all about it. Join me in this master class we’ll dive into the wonderful world of Berthe Morisot, the forgotten Impressionist. We’ll learn about her life in Paris and her relationships with the better known Impressionists. We’ll learn from a video book tour how to identify distinguishing characteristics of Morisot’s mark making and beautiful brushstrokes and learn to incorporate them into our own work. In this study, we will explore Morisot’s pencil sketches, pastel, watercolor and oil paintings in up-close detail. We’ll recreate some of Morisot’s work, adding our own unique style to make the artwork our own. We’ll recreate one of Morisot’s still life paintings, using a limited brushstroke technique that refines our painting skills. In true Morisot style, we’ll create both an oil and a watercolor study of the same scene to see if we can unify our styles between mediums. With additional portrait and value studies, we’ll round out our work in full circle, using all the mediums Morisot used in her works of art. This class will leave us with a better understanding of Morisot’s charming artwork and hopefully a desire to make further studies on our own. Lastly, we’ll have a place to share our work in a pleasant online community. -Discover the techniques that makes Morisot’s art so unique. -Recreate the masterpieces in your own style. -Glimpse into the private lives of the first Impressionists. -Explore the world of Berthe Morisot and her French way of living. -Open the doors to new ways to study some of your favorite art. -Remember that practice IS art and simple studies can make a world of difference. -Have fun exploring your supplies and joining in with a community of artists.